What is Caraway and How Do You Use It? You probably recognize caraway seeds from rye bread. I remember eating pumpernickel bread as a child at my grandparents’ house and loving the anise-like sweet taste of the seeds in it. Later, I learned that many countries use caraway to add these complex notes to their dishes. (Just don’t confuse caraway with Persian sajira or black cumin, these two have a similar appearance but stronger cumin notes). Mostly popular in European cuisines, caraway can be found in British seed cake, caraway-flavored spirits like German Kummel, Tunisian tabil (spice blend), cheeses, stews, sausages, cabbage dishes, and pickle brine. I especially love the North African methods of adding it to vegetable dishes and condiments. 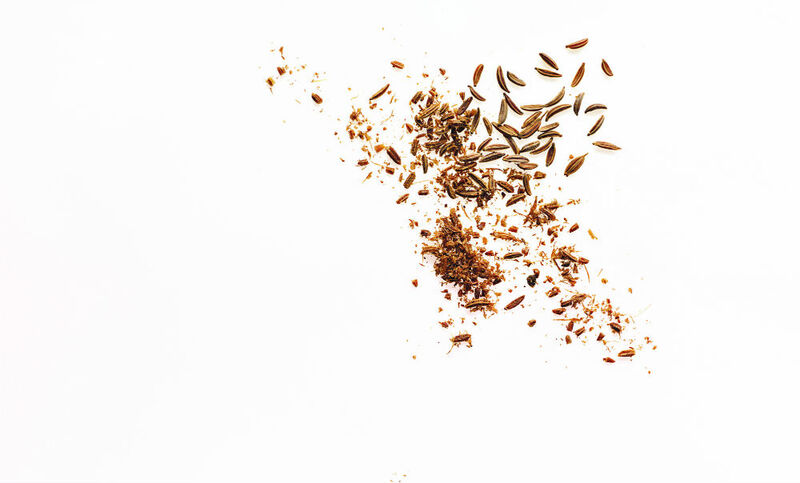 The size of the seed is also perfect for using whole in many recipes, and caraway works great with fruit and cheese. Caraway also adds a great color and texture to whitefish salad. FLAVOR & AROMA With a strong aroma and a lingering flavor, caraway seeds are a cross between cumin and fennel with hints of anise. Many people who do not care much for fennel-anise flavors do like caraway, because of its depth of flavor and milder notes. They add a fresh, sweet, and savory element to a variety of dishes, developing a layer of complexity in both taste and texture. ORIGIN Native to Central Europe through Asia. Cultivated mainly in Holland, but also Finland, Eastern Europe, Germany, Canada, the United States, and North Africa. Recommended recipe pairings include pickled carrots, leek soup, wheat berries, gravlax and even biscotti. Recommended spice pairings include clove, dill, Espelette chile, juniper berries and orange peel. 1. Season grated carrots with toasted caraway seeds and add raisins, lemon juice, and cayenne for a fresh salad. 2. In a blender, puree cooked English peas, toasted caraway seeds, garlic, and salted butter for a side dish. 3. Spread Dijon mustard on pork chops, season with caraway seeds and coarse black pepper, and broil. Traditional uses for caraway include Aquavit (Scandinavia); Harissa (Tunisia) Jewish rye breads/German pumpernickel breads (Europe and Israel); Pain d’epices or gingerbread (France); and cabbage borscht (Central Europe). Use this blend to season halved Brussels sprouts before sautéing and again when deglazing with an anise-based spirit such as Aquavit. Yields approximately 2 Tablespoons/25 grams. Reprinted from The Spice Companion. Copyright © 2016 by Lior Lev Sercarz. Photographs copyright © 2016 by Thomas Schauer. Illustrations copyright@ 2016 by Nadine Bernard Westcott. Published by Clarkson Potter/Publishers, an imprint of Penguin Random House, LLC.